Frankie: The Dog Behind the Logo | Will My Dog Hate Me? Frankie has been the face of my blog since the beginning — and a very handsome one, if I may say so. I’ve never really looked below the surface, though, just glibly referring to him as a terrier mix. What kind of terrier are we talking about? Mixed with what? It’s time to get on the couch for some analysis, Frankie and …oops, you’re already there! Weight: 10 pounds, more or less. Length: Loooong…dare I say Dachshund-ish? Coat: Frankie has thin hair, but a lot of it, and it’s fluffy. It grows, but not too fast — luckily for him, because he gets home groomed, and I’ve been known to give him some seriously bad haircuts. He doesn’t shed, but here’s something peculiar: His hair color seems to change at different times of the year. Mostly he’s off-white — or champagne, as he prefers — but he has definite brown highlights that are more prominent on occasion. Is there a pattern to this metamorphosis? Sorry, I haven’t kept track. 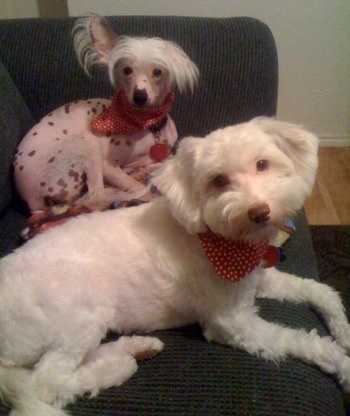 Bone structure: Under all that hair there’s a little skinny face and body (see Chinese Crested, below). I thought of taking a picture of him wet to show you, but it’s 20° F here today. And seeing him that way makes me sad because he looks so vulnerable (not to mention pissed off). Temperament: Frankie is a dual personality dog. Inside the house, he’s stubborn, smart (as in manipulative) and stroppy. Outdoors he’s shy, fearful. Nature vs nurture in action! Bark: Deep for a small dog. A friend who has a yappier pup compared their vocal effects as jazz vs Chinese opera. Frankie was saved by my friend Rebecca under the aegis of Arizona Schnauzer Rescue but no one tends to think he looks schnauzerish. As I often say, there just wasn’t any Arizona Cute Fuzzy Dog of Indeterminate Origin rescue group. Early on, someone suggested that Frankie might be a Chinese Crested. That freaked me out — sorry Chinese Crested fans, but you’ve got to know your breed is always ranked high in Ugliest Dog contests — until I realized there is a hairier and cuter variety, called the Powder Puff. I once encountered a woman in a parking lot who had a dog that could have been a Frankie clone, the resemblance was that close. Naturally I struck up a conversation with her. She responded to my inquiry about her dog in a thick Latin American accent, “Thees is Cha Cha and shee ees a Terripoo.” I’m still not sure which terri we’re talking about, but thinking about Cha Cha always makes me want to dance! *No question: If you match this analysis with his physical characteristics, it seems Frankie was a case of diabetes just waiting to happen; add the steroids taken for his back problems, and it seems almost inevitable. This is a Magical Mystery Mutt Tour Blog Hop, brought to you by yours truly, Peggy’s Pet Place, and I Still Want More Puppies. Want to join? P.S. According to code queen Janet (see #2) I have used curly quotes instead of straight quotes so the code doesn’t work. They look straight on this end — and I cut and pasted what I used — but if your quotes are curly, you go straighten them out! 2. Grab our Magical Mystery Mutt Tour Blog Hop Badge and include it on your post (also optional). Not optional. A BIG thank you to Janet Merriman at Rough Toy Reviews for creating the wonderful badge! 3. Follow the co-hosts and comment on our blogs to let us know you’ve joined the hop and that you like us. 4. Check out the other blogs on the Linky and have a guess fest! That’s the first time I’ve seen a picture of Frankie that wasn’t foreshortened. I had no idea he was such a long drink of water. He may have some dachshund and cairn terrier but he’s certainly all kinds of cute. BTW, I always thought Frankie looked a little like one of the dogs on the OK Go video, the one who steps in and out of the bookcase. Does the resemblance carry over into real life? Thanks for hosting another fun blog hop. Frankie thanks you for the compliment! And no, he doesn’t — except in the generic cute fuzzy white dog sense — look like the OK Go dog, but it sure was fun to watch that video again to check! But then I see the next two pictures and I’m stumped. Interesting… I didn’t think Yorkies were that long. As for coloring, maybe that brown highlighting that I mentioned is Frankie’s inner Yorkie coming through. Silky Terriers are a little longer than yorkies and look similar, maybe that might be in the mix? dandie dinmont terrier [which has quite a long body] and cairn terrier is my guess. 10 pounds…so small! thanks for hosting the hop edie! Thanks, Georgia. I’m actually quite fond of hairless breeds myself –I have fantasies about getting a Mexican breed called the Xoloitzcuintli. It’s the weird shock of hair on the head that makes the Chinese Crested look freaky to me. If you’re going to be hairless, be hairless! OMD, Daddy wants a Xolo too. Mama is not so sure…a dog you have to lotion?! They sure are cute though! That’s the terrier I was thinking of too! The Dandy Dinmont Terrier and Cairn would be my guess too. Sounds just like Gus! All is peachy in his world as long as we’re right there with him. Maybe it’s just too early, but I’m not finding the code to hookup my blog to the hop. Xena’s linked up though, even though her muttable self was not so much of a mystery. It was fun to remember her with a little tribute. Thanks for hosting. If you can share the code, drop me a line at LetsAdoptaDogPark@gmail.com. Thanks! 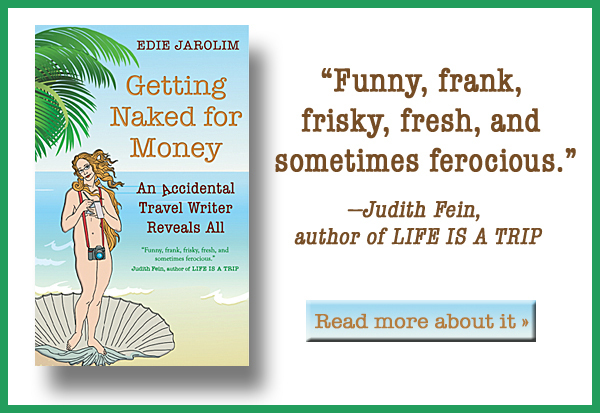 Sent it to you — and by popular demand — posted it here too! Edie, there isn’t a link on the linky link section to add the code to our blog… do you know how to get it? Hi, I just added it to the post (for Blogger and WordPress.org users). I’ll try to dig up the other code later if anyone wants it. Thanks… got it. I had to change the quotation marks in your script to straight quotes to get it to work… just cutting and pasting puts in the curly quotes, which don’t work… if you can replace the quotes in your text above, more people will be successful in getting the code to work. As I said in my update — which oh so belatedly thanked you for creating the badge! — those quotes looked straight to me. And I just cut and pasted from what I used. But perhaps others will find a solution in uncurling those quotes. there are so many possibilities for adorable fluffy white cuties like Frankie! I think you could just make up an awesome designer dog name and say it with conviction… Frankie is a Crested Dandi! Frankie is a YorkaDin… this could be fun! Oooh, I like that! I will just add a tiny hint of condescension when I say, “Oh, you haven’t heard of a YorkaDin”? Yes, Yorkadin, third cousin to Gunga…:) There were a lot of great guesses here but this one stands out from the rest! A CairnDandi, or a YorkaDandi, I like CrestedDandi (not necessarily b/c that’s what Franki is…but it’s a great “designer dog” name!). When people ask what he is you can always answer he’s a Frankie. Hi Edie! Maybe Frankie has some bichon frise. Looks like it in the face. So cute!! The directions said to let you know we like you. Thanks for doing this. I can’t get the links to work on Typepad although I have been able to with previous links. I’m not sure why. It could be that I’m not awake yet. Frankie is adorable no matter what breed. Okay. So I’m not sure what this means, but it can’t be good. I don’t personally know any mystery mutts. All my friends have pure breeds. This is not a good sign, I’m certain of it. 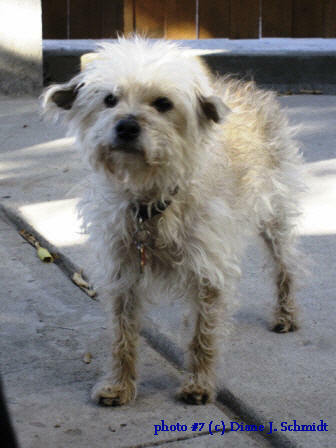 Well, you can claim Frankie as your mystery mutt friend, even though you haven’t personally met him. You would know exactly how to behave towards him because of Sadie (whom we love, even if she is purebred). Thanks for starting this hop! We love seeing everyone’s “mystery mutt”. Hmm…for some reason, wheaten terrier comes to mind although I know they’re larger than Frankie. But maybe wheaten terrier and dachshund (or mini dachshund)? Wheaten, Cairn, and doxie? Regardless of the mix, he definitely came out as a purebred cutie! I am going to guess some Cairn as well. There is a “Toto-ness” about the face and ears. The petite size suggests yorkie, but the hair type, hmm…perhaps there is more going on. Love the idea for this hop and I will spend a good deal of the weekend visiting as many as I can. What better to do when the inches of snow equates to the digits of temperature. I am hoping to get a post written as well and link up later. Give Frankie a hug from me. Awwww…can he come out and play? I have always seen Frankie as a Yorkshire terrier with maybe a some Australien terrier in one of his parents. Doens’t that also matches his personality? I have no idea what his “mix” is, but he sure is cute! I tried to scroll through the comments as fast as I could so I wouldn’t see anyone’s guesses to influence me! I would have to guess Bichon and Yorkie??? He’s definitely part terrier – maybe Norfolk? Frankie is a cute little dog, no doubt about that. If only I knew more about breeds… From what I know, he looks a bit like a bichon, which is quite a popular breed here. The muzzle sure suggests that. I’m also following you on facebook and twitter and decided to join the hop. Up close and personal (sorry, Frankie, I wasn’t being fresh, just trying to groom you), Our Hero does have the face and muzzle of a Yorkie, although he certainly does not have the coat or coloration. His ruler-of-my-personal-kingdom personality is also Yorkie-ish. But I have no idea what else went into creating that incredibly cute package, DNA-wise. About that Arizona Schnauzer Rescue moniker, when I was their Tucson rep I was definitely a naughty rescuer, when it came to sticking to just schnauzers. I always figured that if a dog was small and cute and cuddly, I could find a home for him or her. And I wasn’t going to be a racist about it all! Especially not when a little guy, like Frankie, had flunked out of another rescue and was on his way to doggie death row!!! Oh yeah, that idiot who didn’t like boy dogs. I am still astounded by the notion that anyone could resist the Frankie face. I couldn’t, and I’d held out for… well, the entire previous part of my life. Maybe Bichon and…ugh no idea! Thanks for doing the blog hop. It’s been fun checking out all the pups. I still have more to get to. Frankie thanks you all for coming by and trying to unravel the secret of his identity, and hopes others will continue showering him with attention. He thinks Bichons, Cairns, and Yorkies — which have dominated the guesses — are all very attractive but so far likes Alison’s suggestion of telling people he’s “a Frankie” best. He’s a very cute little guy! Thanks again for putting this together. I’m just getting a chance to start hopping, but it’s been so much fun to see all the comments and tweets today. Frankie’s a tough nut to crack. I’m going to jump on the Bichon bandwagon. Especially after clicking on Hawk’s bichon-yorkie link. He’s definitely 100% adorable! What a cutie! I had a yorkie thought mostly because of Frankie’s size and the color changes. Opie has some grey and brown “highlights” that come and go. I’m pretty sure that that’s a yorkie thing. I’d throw in some poodle as well. My best friend had a toy poodle that looked tremendously like Frankie. His name was Snow. If Frankie likes to jump ( ergo causing back trouble) then I feel more confident about the poodle. Is Frankie hypoallergenic — both dog’s I’ve mentioned don’t make me sneeze. Bichon is definitely a possiblity as well. What he really is — 100% CUTE! As I just mentioned on your blog, Opie looks quite a bit like Frankie (or vice versa) in some pics, only larger. He has those sweet bichon eyes! We just love his fluffball look! Sorry I’m a little late to the party, but I was bizzy, bizzy, bizzy with making dog collars and that *is* a good thing!! I’m going to go rogue on the terrier part and say that Frankie has some westie in him and probably poodle, as well. The idea of bichon heritage is a good possibility, too. Not late at all; the festivities continue through Monday. Glad to hear the collar biz is buzzin’! There is definitely a poodle factor that I believe has been downplayed. Well, we know your Frankie isn’t related to my Frankie but he’s equally as cute, handsome and lovable:) I’m going to go with toy Poodle, Bichon and Yorkie. Thanks for hosting a fun Hop. I’m never going to get around everybody!! Me neither, but I’m trying! Thanks for participating. We would have loved to have you take part, but I understand and appreciate your taking the time out of the craziness of your move to stop by. Good luck with it; moving is one of the most stressful things people can do. I hope that, in addition to stopping here, you’re hopping around and looking at lots of cute pictures of mutts! That’s got to lower your stress levels! I’m thinking maybe a little maltese? His face reminds me of my parents dog that is a maltese-shih tzu mix? I’d throw some terrier in there too! Love his little ears in the second picture! Thank you for noticing Frankie’s ears! They’re one of my favorite features — the other is his little button nose — and the reason why I often call him bat boy. Well whatever he is mixed with, he’s gorgeous. 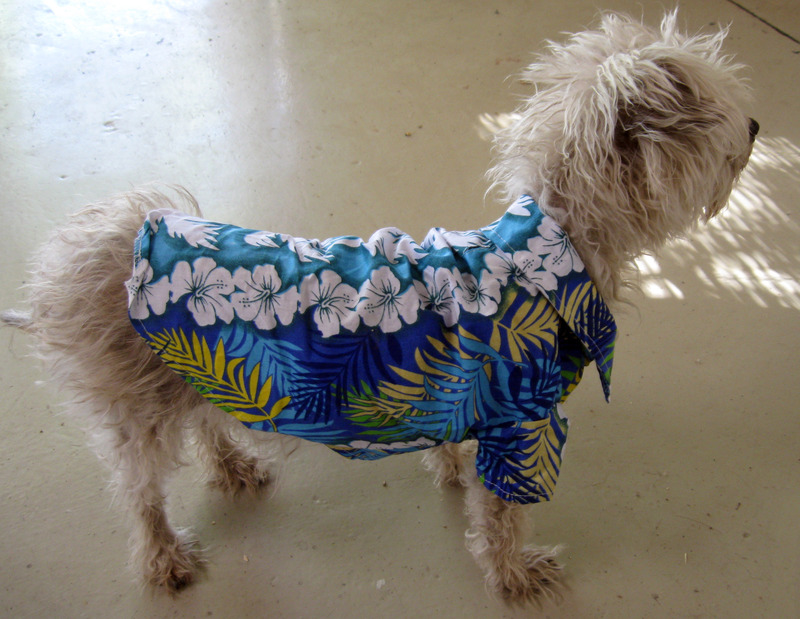 I thought, before seeing his dachsund body, of west highland terrier, like my Dougie. Dougie is pure breed, his hair thick though and body sturdy but not as long as Frankie. Dougie too when wet looks forlorn and pathetically skinny!! Definitely mouth, nose and eyes very westie though.